Using FlameGaphs for investigating performance problem can be a valuable asset for quick resolution and identification of the root cause. This type of analysis may be needed when the traditional oracle instrumentation are not enough. What i will cover here is a tiny script i written for generating 3 types of extended flamegaph using the build in perf tool. I said extend because they actually include the oracle wait events. I used perf for profiling stack trace at 999Hz .And then based on the work on part 1 i added the oracle state (wait event or on cpu) before generating the extended on cpu flamegraph. 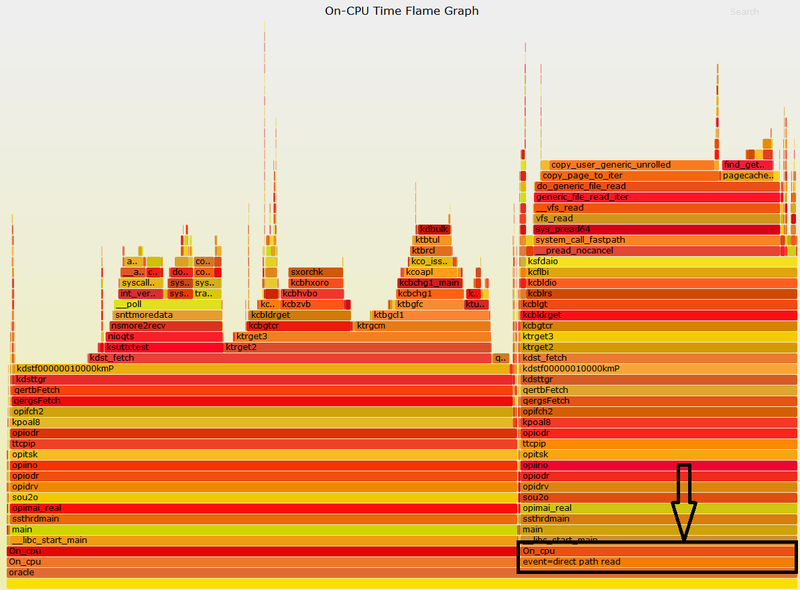 Generating extended Off cpu flamegraph is possible using perf tools as explained here .The overhead is minimized as we are matching on a single PID . 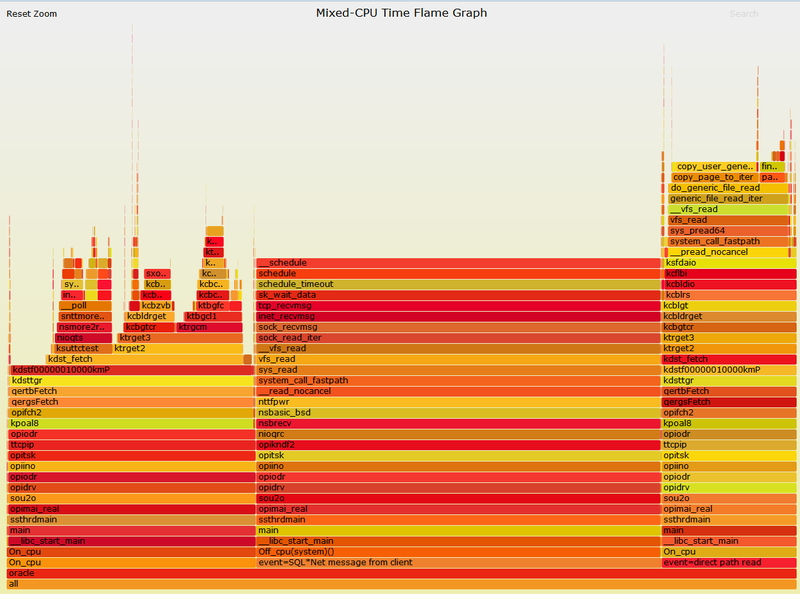 In the HOT/COLD extended flamegraph i will merge both Off cpu and On cpu graph to obtain a global view. I used OEL6 with the debug version of UEK4 (.debug) because older kernel lack the command ‘perf script -F period’ which is needed for generating the off cpu flame graph and also because CONFIG_SCHEDSTATS (insure that all needed tracepoints for off cpu generation are present) is set to yes only in the debug version. For the database version i hit some problem when trying to put probe point when using an oracle 12.1.0.2.6 version so i switched to and older one in my case 11.2.0.3 but it also work with a 11.2.0.4 version as tested by Luca Canali post. Fetch from a big table created on a tablespace build on a ramfs file system to simulate a very fast storage using a direct path read mode. This script will generate 3 flamegraph. We can easily spot that the wait event “Direct path read” is burning CPU . That’s it 😀 Stay tuned and happy tuning !